Before the loin-clothed Neanderthal orphan and the Uzi-loving cybernetic organism, Arnold Schwarzenegger scored one of the most influential acting roles of his career: himself. What makes cult ‘70s bodybuilding documentary Pumping Iron such an interesting bridge between Arnie’s pro Adonis years and his birth as a big-screen anti-hero is the fact that it isn’t a documentary at all. Adapting his own book about the pain and pressure of bodybuilding, Brit photographer George Butler co-directs with Winter Soldier DoP Robert Fiore to cannily twist their account of the 1975 Mr Olympia competition into an oiled-up, faked-up mini-drama of rivalry, vanity and star power. Charismatic, camera-smart and quick-witted, the 28-year-old Schwarzenegger casts himself as the main attraction with ruthless glee. He casually lies that he was too busy training to fly back home for his dad’s funeral (“What’s the use? He’s already dead”) while spouting out priceless alpha-male zingers (“Pumping iron is a great feeling… like coming. I am coming day and night – it’s fantastic!”). Poor Lou Ferrigno. Caught between his father’s ear-bashing, Arnie’s mind-games and the directors’ prompts, the adorable simpleton-giant doesn’t stand a chance against his rival’s mega-watt confidence. Green body-paint and bad hair awaited Ferrigno as TV’s Incredible Hulk . But Pumping Iron proves Schwarzenegger’s staggering lifetime of success was never really down to his Herculean shanks of muscle – the Big Oak was a natural performer born with juggernaut self-belief. Much of this we learn from the featurettes bolted to the Region One Pumping Iron DVD – none of which appear on this new ‘Special Edition’. Instead we get The Hard Science Of Bodybuilding, a generally useless 20-minute surface-skim of training and diet techniques. 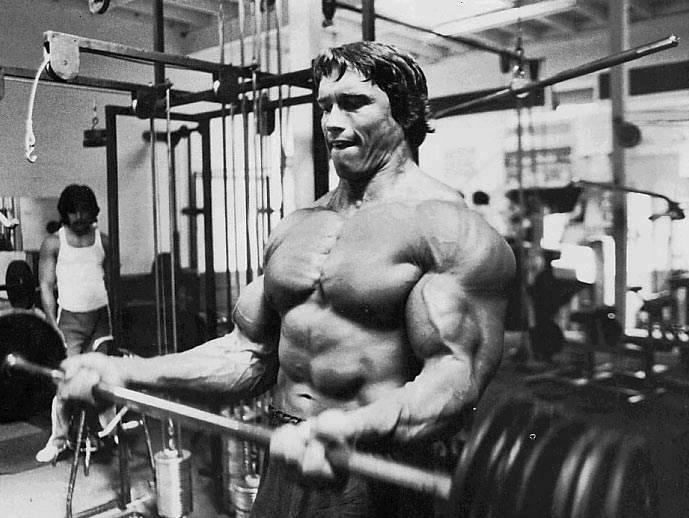 “It is the mind that really creates the body,” says Arnie. Yes, and it’s also a lot of steroids, something that’s never once mentioned by the featurette’s trainers and veiny maniacs. “I put five hours a day into working out,” recalls Ah-nuld, on the short interview that completes the meagre bonus supps. “So I applied the same amount of will to my acting class. I wanted to be another Clint Eastwood, John Wayne, Kirk Douglas. All those heroes I admired when I was a kid. All the people said, ‘You’ll never make it’, because of your accent, because your body is too big, because no one can pronounce your name. It doesn’t matter. Because I knew.” Stirring stuff. Shame it rapidly evaporates into a promo piece for Arnie’s governatorship, complete with heroic score trumpeting in the background. Still, there’s no beating the classic final image: a victorious Ah-nuld stretched out on his back with a plate of fried chicken on his washboard stomach, wearing a T-shirt that reads “Arnold Is Numero Uno”, a reefer in one hand and a glass of champagne in the other. He’d be back all right.